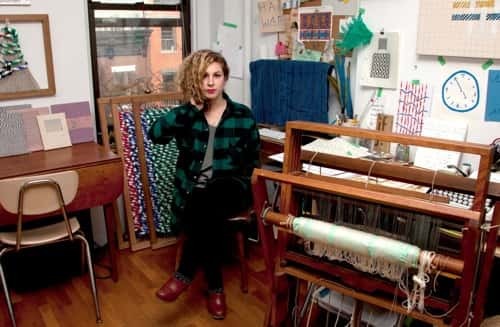 Francesca Capone is a visual artist, poet, and textile designer. Her books Text means Tissue (2017), and Writing in Threads (2015) focus on textile poetics and are available through Printed Matter. She has exhibited at Whitechapel Gallery in London, LUMA/Westbau in Switzerland, Textile Arts Center in NYC, and 99¢ Plus Gallery in Brooklyn. She has been an artist in residence at the Anni and Josef Albers Foundation, Andrea Zittel's AZ West, and the Haystack Mountain School of Crafts. More of her published work can be found at Gauss PDF, Tunica Magazine, Poor Claudia, Petrella’s Imports, and in The New Concrete from Hayward Press. Her academic work includes lectures and workshops at Brown University, Rhode Island School of Design, Reed College, University of Washington, and Alberta College of Art and Design, among others.